I’m always on the hunt for quick and easy meals. Always. We have our standards and favorites, but there’s always room for more. 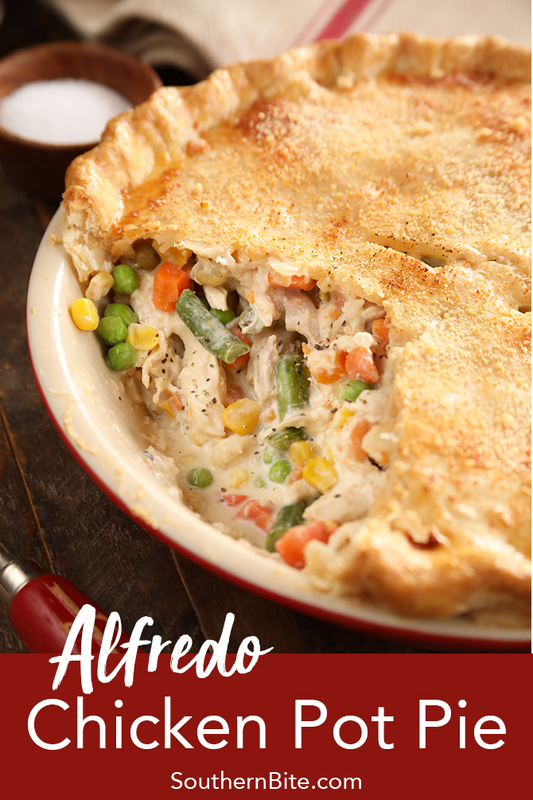 Such is the case with this Alfredo Chicken Pot Pie. 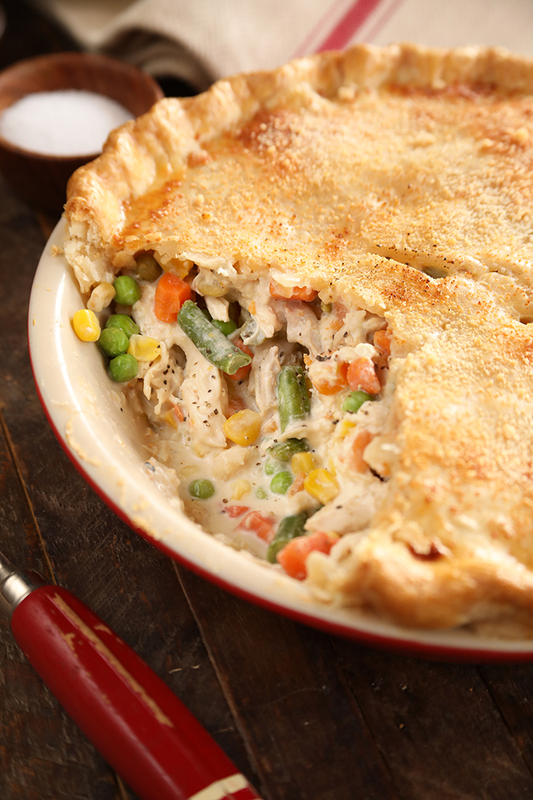 We love our classic Chicken Pot Pie, but this time I switched out the standard cream of chicken with jarred alfredo sauce and my family just loved it. 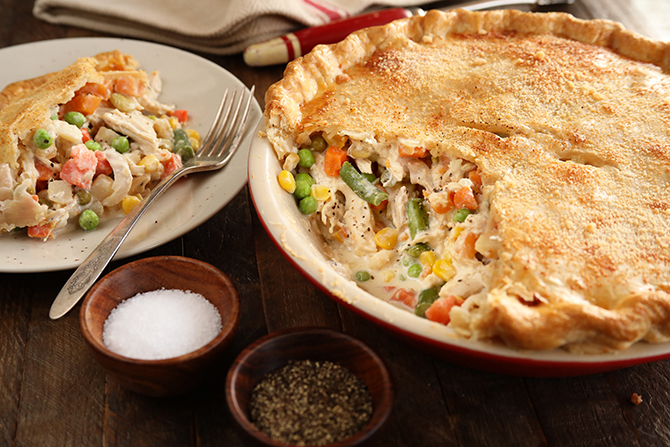 Think classic chicken pot pie, but kicked up with the delicious flavors of cream and parmesan from the alfredo sauce. And y’all, this is ridiculously easy. You can make it with as few as 4 ingredients. For real. 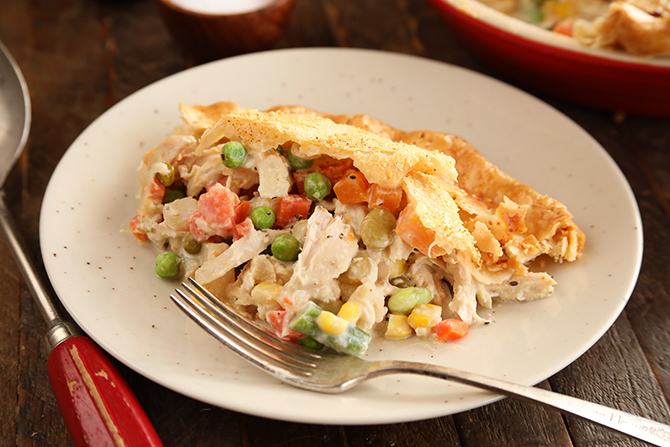 A rotisserie chicken saves you the time it would take to cook and shred chicken (it adds great flavor, too) and the rest is refrigerated pie crust, canned veggies, and the alfredo sauce. SO quick and easy! If I’m feeling fancy, I like to take it to the next level and brush the crust with an egg wash to get that golden brown color and then top it with grated parmesan cheese, but it’s totally optional. There are tons of different alfredo sauces out there all with different flavors. I usually just go with plain alfredo for this, but you can switch it up by using garlic alfredo, basil alfredo, etc. The mushroom alfredo is pretty magical in this, too. But with each of them, they’ll have varying levels of salt so be sure to taste the mixture before adding much salt and pepper. You may not need it at all. Preheat the oven to 400°F. 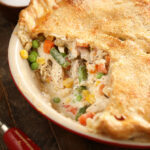 In a large bowl, combine the chicken, alfredo sauce, and drained vegetables. Mix gently. Add salt and pepper to taste. Unroll one of the pie crusts and line the bottom and sides of a deep dish 10-inch glass or ceramic pie plate. Spoon the filling into the crust. Unroll the other crust and lay it over the top. Pinch the edges of the two crusts together. Cut 4 1-inch slits in the top crust to allow the air to escape. Optional: In a small bowl whisk the egg and the water together. Lightly brush the top crust with the egg wash. This allows the crust to develop a beautiful golden brown color as it bakes. Sprinkle the parmesan cheese evenly over the crust. Bake for 30 to 35 minutes or until the crust is golden brown and the filling is heated through. Allow to rest for about 5 minutes before serving. You can swap the canned mixed veggies out for about 3 cups of frozen, thawed mixed vegetables if you wish.